Teams from the same confederation were not drawn into the same group, therefore Egypt was drawn into Group B. Also as result, Italy and Spain were drawn into different groups. The official match ball for the 2009 FIFA Confederations Cup was the Adidas Kopanya. The name means "join together" in Southern Sesotho, one of the 11 official languages of South Africa. The panel configuration of the ball is the same as that of the Teamgeist and Europass balls that came before it. The ball is white, accentuated with bold black lines and detailed with typical Ndebele designs in red, yellow, green and blue. Four cities served as the venues for the 2009 FIFA Confederations Cup. 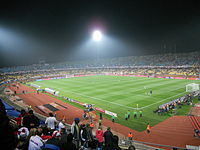 All four venues were also used for the 2010 FIFA World Cup. Originally, Port Elizabeth's Nelson Mandela Bay Stadium was also chosen as a venue. 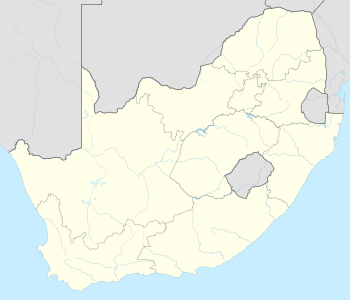 On 8 July 2008, however, Port Elizabeth withdrew as a host city because its stadium was deemed unlikely to meet the 30 March 2009 deadline for completion. The Nelson Mandela Bay stadium was subsequently completed before the Confederations Cup and was opened on 7 June 2009. 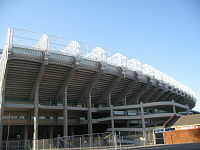 It acted as a venue for the 2009 British and Irish Lions tour to South Africa on 16 June. All of these stadia hosted matches during the Lions tour, but a minimum of nine days was allowed for pitch recovery between a rugby match and a Confederations Cup match. The referees were announced on 5 May. Two referee teams (led by Carlos Batres and Carlos Amarilla respectively) withdrew due to injuries. Replacements from the same confederation, led by Benito Archundia and Pablo Pozo, were selected. Luís Fabiano received the Golden Shoe award for scoring five goals. In total, 44 goals were scored by 27 different players, with only one of them credited as own goal. ^ "Quedan listos Grupos de Copa Confederaciones". Fox Sports. 22 November 2008. Archived from the original on 11 June 2009. Retrieved 21 June 2009. ^ "Confederations Cup ticket sale opens on 23 November". FIFA.com. 21 November 2008. Retrieved 26 June 2009. ^ "SA seeded for Confederations Cup". BBC Sport. 6 October 2008. Archived from the original on 26 May 2009. Retrieved 21 June 2009. ^ "España es el indiscutible favorito". Fox Sports. 22 November 2008. Archived from the original on 11 June 2009. Retrieved 21 June 2009. ^ "Italia y Brasil en el mismo Grupo". Fox Sports. 22 November 2008. Archived from the original on 11 June 2009. Retrieved 21 June 2009. ^ "A vibrant ball for the rainbow nation". FIFA.com. Fédération Internationale de Football Association. 19 November 2008. Retrieved 12 December 2009. ^ "Host Cities". FIFA.com. Fédération Internationale de Football Association. 9 July 2008. Archived from the original on 8 July 2008. Retrieved 9 July 2008. ^ "Port Elizabeth to wait until 2010". FIFA.com. Fédération Internationale de Football Association. 9 July 2008. Archived from the original on 12 July 2008. Retrieved 9 July 2008. ^ "FIFA appoints match officials". FIFA.com. Zürich. 5 May 2009. Archived from the original on 9 May 2009. Retrieved 26 May 2009. ^ "Two referees replaced due to injury". FIFA.com. Zürich. 5 June 2009. Archived from the original on 11 June 2009. Retrieved 6 June 2009. ^ "Regulations FIFA Confederations Cup South Africa 2009" (PDF). FIFA.com. June 2008. Retrieved 21 June 2009. ^ "Users pick Top 11". FIFA.com. Fédération Internationale de Football Association. 30 June 2009. Archived from the original on 14 May 2013. Retrieved 30 June 2013. Wikimedia Commons has media related to 2009 FIFA Confederations Cup.